The Rickshaw Challenge was conceived in 2006 by Aravind Bremanandam, from Tamil Nadu in India. 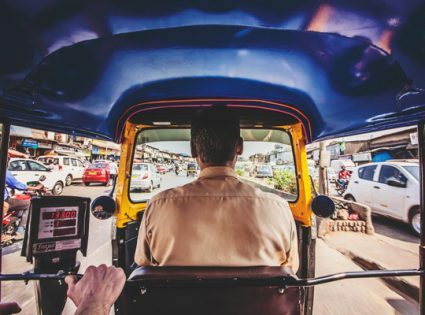 Aravind’s passion for motor cars and driving led him to setup the challenge of driving Rickshaws across several exciting routes through the cities and countryside of India. Aravind first encountered the rickshaw vehicles as a child, his family in India owned one of the cars and as he got older it seemed to be a novel motor vehicle to use in what would become a unique and remarkable auto sport. Aravind first came up with the concept and idea of the Rickshaw Challenge to offer a unique adventure and motor sport experience to driving enthusiasts globally. The Rickshaw Challenge firmly believes in participating, not simply passing through, the lives of the people in villages and cities along the route. Rickshaw Challenge has teamed up with Round Table India, a national organization that oversees charitable needs, donations, and projects. The Rickshaw Challenge brings together teams of Rickshaw driving enthusiasts divided into groups of up to three people traveling in their rickshaw along a predetermined driving route in India. So What Exactly is a Rickshaw? A rickshaw is a unique style of motor vehicle, popular for making short trips across the cities and rural areas of India. The rickshaw is an iconic vehicle of India, embedded in culture in much the same way that a black cab or red London bus is so quintessentially English. Auto rickshaws are very common vehicles in India and also several other countries, they are three wheeled cars which add to their driving charm. There are different sizes of car but the rickshaws used for the Rickshaw Challenge support three occupants. The Rickshaw Challenge, based on popular inquiries also offers Tuk Tuk Fans and enthusiasts new and refurbished rickshaws for sale on the Rickshaw Challenge web site. The adventurers who participate in the Rickshaw Challenge originate from countries as far separated as the United Kingdom and Ireland, Chile, Spain, Australia, New Zealand and Canada. They come to drive the Rickshaws in India in search of something a bit different and a life changing adventure driving experience. Each rickshaw vehicle is frequently painted in bright colors and adorned with different emblems such as orange and silver, and decked out with patterns, tassels and beads and other symbols and crafts. Often the overall excitement of the trip is enhanced on account of no maps or limited directions, often relying on locals from villages and bystanders to help guide the rickshaw racers on their way. Adventurers around the world often find out about the Rickshaw Challenge from travel sites, adventure bloggers and word of mouth. So said one driver said recently when asked about his experience participating in the Rickshaw Challenge. Presently The Rickshaw Challenge operates across four popular and diverse routes in India. The races are of different durations and offer unique challenges to each rickshaw driver. Classic Rickshaw Run – The Rickshaw Challenge Classic Run is where the Rickshaw Challenge all began in 2006! The Classic Run is an eleven night journey that covers the very best that there is to see of the states of Tamil Nadu and Kerala, in southern India. Malabar Rampage – The Rickshaw Challenge MALABAR RAMPAGE entails riding across the Malabar Coast of India (west coast) covering the states of Kerala, Karnataka and the Union Territory of Goa. With a distance of close to 1100 kms (680 miles), the ride encompasses some breath taking scenic views and historical cities. The pleasant weather during this part of the year, only makes the ride more enjoyable. Icing in the cake would be the stay at Margao, one of the famous beach destinations in the world. Deccan Odyssey – The Rickshaw Challenge DECCAN ODYSSEY is a ride on a remarkable sojourn of a land shining in legions grandeur – serene beaches, magnificent forts – palaces and experiencing divine tales etched in colossal rocks. This week-long journey is through some of the best places in Maharashtra and Karnataka starting from Goa. One can experience the best of tourism assets such as pristine beauty of Konkan coast, the art, the culture, the wildlife, the heritage (including world heritage sites of Ajanta – Ellora), local arts, crafts and cuisine. Mumbai Xpress – The Rickshaw challenge MUMBAI XPRESS will follow an extensive route through the four states of India – Tamil Nadu, Karnataka, Goa and Maharashtra. With a dauntless army of fellow adventurers, you will follow a 13-stage course that will take you over 1,900 kilometers (roughly 1,180 miles). Your Auto Rickshaw will cut through hills, valleys and beaches cruising along the most exotic and scenic places in the whole Indian countryside. If you have an adventurous spirit and are contemplating entering into the next Rickshaw Challenge race then it is possible to find out more about the rickshaw race with instructions how how to join the rickshaw challenge. Participating in the rickshaw race is ideal for small groups but individual adventurers can also get involved and will often pair up with another racer. For more details on how to get involved in the Rickshaw Challenge or other similar adventure trips contact the organizers ‘ The Travel Scientists ‘ via their website and they will get back to you as soon as possible.